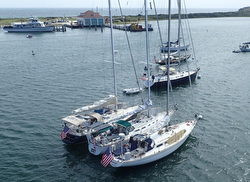 (Newport, RI)- Brad Read, owner of the J/40 NEPENTHE (and Executive Director of SAIL NEWPORT), wrote an awesome article for Windcheck Magazine about the fun and amazing times their family have had for decades cruising in company with friends. Here is his story. “To paraphrase Lt. Jonathan Kendrick from A Few Good Men, “I have two books on my bedside table: the Eldridge Tide and Pilot Book and The 12 Volt Bible. The only proper cruising authorities I’m aware of are George W. Eldridge, Donald J. Street, and Robert W. Read.” With that in mind, here are a few things my wife Cara and I have learned over many years of family cruising. We have, for the last six years, scheduled our “Kiddie Cruise” to coincide with several other families’ summer plans (as well as Eldridge’s guidelines!). This is a Read family tradition that goes back to when I was a boy. Our parents teamed up with six or seven other families and we “went east” as a group. I seem to remember those days more than I remember any other time during my childhood, thanks to the Pearson, Boss, Hazelhurst, Walls, Barney and Mulervy families, and so many other families we cruised with! We are so fortunate to have cruised with a great group of families over the years: The Burkes, the Marstons, the MacGillivrays, the Hoods, and other families that we have met up with along the way. Usually by February, we have chosen “the week” so that one of our team can arrange their charter. For the boys, we plan on how to adequately balance the weight of the “adult beverages” offset by the food and water tanks! The girls have been the masters of the food planning and have it down. We tend to eat on the boats whenever possible, grilling on the stern pulpits of two or three boats with pastas and vegetables cooked down below. We set up a kids boat and an adult boat. The food is always amazing…everything is better when you are floating in a harbor! 3. Keep the kids psyched. Cara and I both grew up cruising, so it was natural for us to bring our kids cruising when they were little. We’ve been cruising with the kids since they were 5 and 7. We didn’t do much of the ‘toddler cruising’ when they were younger, opting instead for more day trips to secret beaches in our outboard. Although kids of all ages enjoy adventure outings to find new secret beaches, we’ve learned that toys are key. Board games, water toys, beach toys, sailing dinghies, paddleboards, rope swings off the spinnaker pole, dinghy rides…got to make it fun or they won’t want to come! The best thing we ever purchased was an inflatable paddleboard. It is a constant source of entertainment for the kids. We also bring regular paddleboards, kneeboards, surfboards, tow rope, etc., and of course the 11-foot inflatable dinghy. We also tow a small sailing dinghy. Perhaps most importantly, games keep the kids unplugged from the devices! When we are cruising, there are many harbors (coincidentally? conveniently?) that have no cell service! Perfect! I can’t tell you how many games of Bananagrams, go fish, gin rummy, Monopoly and other board games they’ve played! For the most part, the kids unplug from their phones and simply enjoy being in the company of the other kids. Then there is fishing. Thanks to our good friend Nate Burke, we’ve found the secret to keeping the kids occupied on the anchor. Literally before the anchor is set, in whatever harbor we enter, the fishing rods are out. While there are a variety of techniques, we’ve discovered the magic of the “sabiki” rig! We never leave Newport without a stash of Sabiki rigs. Comprising six to ten small hooks on individual dropper lines, they are perfect for small scup that are prevalent in southeastern New England, and also for smaller bluefish, schoolie bass, and the dreaded sea robin. We are a catch and release family, so we don’t do much trolling from harbor to harbor. 4. Go cruising in company. Being with just the family is great for a three-day weekend, but cruising with other families is a huge advantage! From pre-cruise provisioning and who is bringing what toys to dealing with any issues we have with the boats, we are a team, and having other kids, friends and boats around makes it so much fun. On our cruises, there are seldom times where just one family is on one boat. The kids (and adults) are everywhere. We set up a ‘kids’ boat’ and an ‘adult boat’ for dinners and breakfasts. Coffee in the morning often turns into a full comedy show among the parents, and everyone loves blowing off the cannon at dusk. From dinghy adventures into town to poring over the Eldridge and the weather to find the next night’s anchorage, it’s so fun going with other families! It has been great having all of our boats draw less than 5.25 feet. We can get into some really skinny spots and anchor where there are not a lot of boats. I have been cruising southeastern New England for nearly all my life. I absolutely love sailing on Narragansett Bay, and encourage everyone to explore its nooks and crannies and many wonderful harbors. When we travel outside Narragansett Bay, we tend to head east, with Cuttyhunk being the natural first night/last night harbor. It’s quaint but busy, with great little beaches where you can watch the world go by coming in and out of the harbor. (Editors Note: They gotta wicked awesome fish dip there too, Pally) We also enjoy visiting Quick’s Hole, Tarpaulin Cove or West Beach along the Elizabeth Islands chain for lunch and swimming. Depending on weather and tide, we might also hop over to Menemsha or maybe Tashmoo on Martha’s Vineyard for an overnight. We always go to Edgartown, rent a mooring and do a trip to Katama and South Shore beaches of the Vineyard. A personal favorite is Cotuit, which we can (barely) fit into. 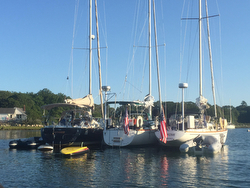 The channel leading in is amazing and while we don’t go there each year, it is a treat to make it through that amazing waterway and into Cotuit Harbor. And then there is Hadley’s Harbor, which is simply one of the most idyllic harbors in the world. With deer and horses roaming the hills above the anchorage and gorgeous shallow rivers to explore in the dinghies and paddleboards, it is my favorite harbor, bar none. We have been (mostly) an all-sail squadron, but one of our families has just gone the lobster boat route, refurbishing a beautiful Holland 32. This will be the first year of that boat, which will allow for a bit more range on day trips: Cape Poge Bay, and maybe a jaunt to Tuckernuck. Can’t wait to see the dynamic of all the kids wanting to go on the powerboat to get to the next harbor quicker! Thanks to Ben Cesare and Windcheck Magazine Add to Flipboard Magazine.